Here's a place to talk about the ruggers! Good games this weekend, ENG v SCO and WAL v IRE! And France are in Rome as well, Italy could have an edge there despite France's resurgency. On the bench, you'd have players like Scott Williams, Halfpenny, Farrell, Ford, Watson, Joseph, Nowell, Mako Vunipola, Duncan Taylor, WP Nel, Alun Wyn Jones, Biggar, Sam Davies, Ken Owens, Zebo, Kearney, Ringrose, Conor Murray &c.
Never get much rugby discussion here outside of the fantasy comp threads so nice to see this. Watching the game tomorrow night and suspect that this will be the main topic of conversation. Can't argue with your all Irish front row. Mako goes as an impact player, as does Jamie George. Ken Owens should be back up, and Cian Healey and Cole should be on the plane. Might be a bolter spot for Sinkler. Looks a great prospect. Not sure about Hartley, but I guess he'll be in the squad. No idea about second row. AWJ fits the captain mould but not guaranteed a starting place. Kruis (if fit) goes, but Launchberry is turning into a really good player, O'Ryan and Toner, plus both Greys are all good options. Itoje has to be on the plane though. Such a great player despite his age and maybe our best chance of coping with Brodie Retallick. CJ Stander looks like a starter, and Warburtons experience will see him in the squad. Watson, O'Brian and Tipuric also worthy. Billy V is nailed if he comes back OK from injury. If it wasn't for that he'd be probably first on the teamsheet. Moriarty deserves a place on his 60 minutes against England alone and Heaslip is a class act. Conor Murray and Sexton start as 9-10 for me but Laidlaw and Webb are good options at 9 (maybe Youngs but not convinced yet). Ford is great if we're going forward but not great if we're on the back foot. Russell & Biggar are pushing and Farrell will definitely be on the plane (wouldn't play Russell at 12 though, but might play Farrell there). Henshaw, Ringrose, Dunbar and JD are in the mix at centre, along with Farrell. Wings - North probably goes despite injury, dodgy Swede and poor form, but Daly has earned a place and its hard to leave Liam Williams out. I'd love to see Jack Nowell play but not sure. Hogg at 15. No question. Kearney and Halfpenny on the bench. unc.si. wrote: Never get much rugby discussion here outside of the fantasy comp threads so nice to see this. Some good shouts there! I'd have Laidlaw ahead of Conor Murray - Laidlaw is the form kicker in the squad (maybe even more so than Sexton) and the effect his leadership has on Scotland is plain to see. I'd forgotten about Kruis, admittedly. Launchbury has done particularly well so far this 6N. There are some great centres around right now - Henshaw, Ringrose, Dunbar, Scott Williams for example - and Russell can also play centre. Duncan Taylor is injured right now but is also good. I agree with you about Hamish Watson, he's been great so far this tournament. How about a slight refinement of my side? Bit harsh on Moriarty and Faletau maybe, but that's a very strong squad. There's also Jonathan Joseph waiting in the - well, centre, not wings. Well all the Irish guys took a step further away from the plane yesterday. Webb and Tipuric took a big step forward and North has his name on the starting team sheet already if he carries on like that. Scotland taken apart. Russell looking a midweek Lion at best. Dunbar might as well book a holiday at Lions time on that performance and front row, locks and back row all comprehensively outgunned. Only Huw Jones really came away with any credit. Josephs booked his seat on the plane to NZ. Best he's played for a long time. Farrell and Vunipola are pretty much certs for the squad. Itoje, Lawes and Launchberry all staked their claim and Hartley was back close to his best. What a game by Ireland. England just couldn't live with the ferocity of the Irish forwards. Lineout disrupted, lost the breakdown and the backs were effectively taken out of the game completely by a combination of the Irish not letting England have any fast ball and the line speed and aggression of Henshaw and Ringrose. O'Mahoney, O'Brien and Stander were spitting fire in the Back Row. Furlong, Best and McGrath didn't give a millimetre all game and o"Ryan and Henderson nullified Englands lineout as well as doing their part to choke the life out of Englands big forwards. The Irish front row all look like Lions, Sexton has to be front of the queue for the starting 10 spot now after a brilliant and defiant game against England (although Russell pushing him close after putting his poor performance against England behind him). Don't know how Gatland can leave Henshaw or Ringrose behind either, and that performance by O'Mahoney has given Gatland a few things to think about. For England, Brown was pretty solid, Daly has reinforced what a great all round talent he is. Probably Englands best player in the match. Launchberry, Lawes and Itoje all did OK, albeit probably one of Itoje's worst performances in an England shirt. Think he still gets a seat on the plane though. in the other games - wales were poor all round, but Webb and North have booked their seats and Halfpenny made a big step forward. Liam Williams off the pace but heavily strapped so looked hampered by his leg. Hogg is the biggest certainty for a lions starting place of everyone. Dunbar looked good after his England nightmare, Hamish Watson stepped up and Russell is probably now a certainty for the second Lions 10 spot, still behind Sexton for me. Yeah, guess England needed a reality check, other than against Scotland they've been pretty ordinary this tournament. Reminiscent of the early '00s team who had a habit of losing Grand Slams at the final hurdle, and it proved to be character-building for that generation. Regarding the Wales match, that overtime rule needs looking at, how can you go 20 minutes beyond full time? Fair enough you can't let a team end a match by conceding a penalty, but the team could be given say 2 minutes to score after receiving a penalty, once the clock has gone red. At the moment the game effectively goes on until there's a knock-on/turnover or a score, which leads to these endless scrum scenarios. Lots of talk of Hartley missing out, but apart from the fact that he's England captain (with back to back 6N trophies) it wouldn't be that much of a surprise tbh. Clearly a lot of competition in some positions compared to recent vintages - would have thought experience and leadership would count for a lot though, and so leaving any of the national captains at home would be a questionable decision. Warburton Captain though. No surprise I guess, particularly with Gatland in charge. tbh I don't think there was a real stand out option for captain this time. Looks a decent squad. Some good players unlucky not to get a place, but can't say that there's any massive surprises apart from Ben Te'o being in. Launchbury and Watson probably the most unlucky to miss out. unc.si. wrote: Looks a decent squad. Some good players unlucky not to get a place, but can't say that there's any massive surprises apart from Ben Te'o being in. Launchbury and Watson probably the most unlucky to miss out. Seems like a lot of perhaps misplaced loyalty to the underperforming Welsh, with much-improved Scotland virtually ignored. Biggar v Russel for the 3rd fly half spot. Tough on Fin but Biggars experience probably got him on the plane. If you took out Biggar then he'd still be in a fight with Ford to get the 3rd slot. Grays vs AWJ. Tough call but AWJ is one of those players thats more than the sum of the parts and you just feel like you want him in the tour party. If AWJ got injured then Launchberry and maybe even Ryan would still be ahead of the Grays. Take out JD from the Lions and he'd probably get replaced by Ringrose rather than a Scot. There are mitigating circumstances, but even so that was a shameful shambles of an opener. Of the backs, Sexton was quite shocking and not surprisingly hooked for Farrell who did make a real difference before missing an absolute sitter of a penalty. Watson took his try well but positives were few and far between. Laidlaw's passing wasn't sharp or flat enough for me and Hogg's mishandling of a through ball epitomized a general looseness and lack of concentration. From the pack only Falatau and Sinckler impressed with the Welshman scrambling back to make a try saving tackle after NZPBs butchered a three on one overlap. I know Gatland wanted to rotate and give everyone a try before the first test, but apart from a decent showing from a handful (and that includes replacement Farrell), the only Lions to come out of that with their reputation enhanced are those that were omitted. They should be beating what is in effect an 'out of town' provincial third XV by 50 plus at the minimum, to struggle to even win is staggering. Beating the Auckland Blues and especially the Christchurch Crusaders now looks like climbing Mount Everest and the All Blacks series a potential one-sided mismatch. Although an impossibility as the teams share players i think England or even Ireland would beat this Lions team very comfortably on home soil as that is such a massive advantage in international rugby these days. Possibly puts into perspective how impressive England's 0-3 whitewash of Australia was last year too. The 1971 Lions may be in the history books under exceptional or even heroic. The 2017 ones look on their way to being forever remembered as the lamentable Lions. The NZ tour is always the one that pretty much feels like a lost cause before they even turn up, whereas they've usually got a fighting chance against Australia or South Africa (the current piss weak SA side probably wouldn't provide much of a test at all). The win in Australia four years ago proved the Lions concept still works, but not sure why they've gone down the same route again in coaching terms, Eddie Jones is the man with the recent momentum behind him and might have offered the best prospect of doing something special. forestfan wrote: The NZ tour is always the one that pretty much feels like a lost cause before they even turn up, whereas they've usually got a fighting chance against Australia or South Africa (the current piss weak SA side probably wouldn't provide much of a test at all). Rugby has progressed even in the last four years, and as all sports tend to do, teams are becoming far sharper and more aware of potential strengths and weaknesses and how to expose the latter to the maximum. The game is being played at a far faster pace generally, and especially at clearing out the breakdown and recycling without allowing defences time to reorganise. NZ rugby is by far the most innovative too and the ball transferred with support always to hand even when it reaches the wide men. The Lions are a scratch touring side, no matter how talented the individual players, and with the games' progression, well coached teams of lesser individual ability are becoming very competitive and can and will become too much for them especially on home soil. It's why I would think even a national team, especially one as good as England currently are, would be a far tougher obstacle and much more competitive than the Lions, and why the greater hurdles to come promise utter humiliation. Four years ago may well prove a last swansong of the Lions as the idea of a touring scratch side being competitive against anyone half decent anymore, let alone the World Champions, becomes completely outmoded. tbf Eddie Jones made it clear the Lions wasn't an option for him, his overriding and only aim was to get England really competitive for the next World Cup and give them a real chance of winning it. A first defeat but perhaps an improved showing, although it would be hard to repeat the deep depths to which they sunk in their opener, but it was still only against arguably the weakest of the super rugby franchises that they'll face, far tougher assignments are to come especially the current number one team The Crusaders, never mind the AB's. True, it could be said that the Lions lost out to an outstanding try that ripped through the heart of their defence thanks to two glorious offloads and some superb running lines. It did though epitomise the advantage the Blues had all night when the ball was spread away from the forwards. When the late try came it was completely unexpected because the Lions seemed to have weathered the storm and hauled themselves back into the game thanks to excellent impacts from the bench by the likes of Joe Marler and Kyle Sinckler. But the reality of the situation was that the Blues' try exposed the paucity of the Lions' attack. There was so little imagination in the attacking game, and precisely nothing that will scare the All Blacks. True, the set piece and the driving maul worked brilliantly, but it was almost a cliche of how the southern hemisphere sees the northern game - all slow and grinding forward power and lacking in glory. True, there is still time to improve, and the fact they came so close to victory is testament to the side's character and options up front. This was a big step up from Saturday's awful performance, but the Lions will hope there is a lot left in the locker - and that they are able to find it before they face the All Blacks. The big issue for the Lions though is that they were enjoying more success when they kept it tight, with the forwards - particularly the tight five - enjoying the upper hand pretty much throughout. Robbie Henshaw was the man supposedly picked as a 'battering ram' inside-centre but he showed moments of genuine subtlety and class alongside the more physical element of the game. What the Lions needed was more slight of hand when chances presented themselves, as well as a more ruthless edge to make the most of their dominance - One try having dominated possession and territory in the first half was not enough. The Lions came back thanks to traditional strengths in the tight, but the one moment of genius in the game came from the Blues - and it was enough. I feel a little sorry for Jack Nowell who had an absolute shocker, when he knocked on a simple pass 10 minutes after half-time. With the Lions tour so condensed the players know they will not have many chances to impress, and Nowell was sadly one who fluffed their opportunity completely. The Exeter Chief is a fine player coming in to the tour off the back of a fine season, but he was caught out of position for Reiko Ioane's try, was unfortunate to knock the ball back for Sonny Bill Williams' score and then missed his man as the Blues nearly scored a third. Nowell was not alone, with Jared Payne not at his best before he went off injured, while Dan Biggar having a mixed bag of a game and Rory Best's final lineout throw was the stuff of nightmares. As the clock ticked down desperation seemed to take over for some, and they will be in new territory here - desperate to make the most of brief time on the pitch but knowing selfishness will see their Test chances evaporated. It is unfair to judge them on, say, an hour of rugby, but on a Lions tour some may not get much more than that. The Crusaders were a big step up in opposition from The Blues and especially the Provincial Barbarians, the unofficial 4th test, and the Lions stepped up their game accordingly with a big improvement in intensity. Owen Farrell starting at 10 was immense and his distribution sharp, choosing when to move it quickly or kick, even after going to 12 he took the right options, has to be pencilled in now as a starter. The set-piece and defence were the corner stone of the win and the All Blacks will be concerned as this is likely to be pretty much the test side's pack. Defence and especially the pressure on without the ball allied to the speed of the defensive line was massive. Sexton coming on for Davies gave a vastly improved display admittedly from a very low base , but was far more like it today. Up front Vunipola again played a big part and O'Brien notable as flanker, O'Mahoney at the line-out again essential even disrupting Sam Whitlock on their throw. So many options in the second row but George Kruis now has to be a certainty with Alun Wynn-Jones also playing himself into pole for the other spot. Itoje and Lawes maybe now be looking at the 23 rather than starting. Faletau at number eight looking likely too although Moriarty and Stander alternatives. They're getting there though and tries will come with a little patience and better understanding, they just need to be more clinical and finish any half chances, as they won't get that many vs The AB's. Time isn't on their side though and need to start finishing those chances. What has happened to Australia? 0-3 vs England and now lost to Scotland at home too! The southern hemisphere is now just New Zealand and a load of no hopers. Their rugby championship must be like having NZ and three equivalents of Italy. Think I'd pretty much make that team the starting XV with Farrell for Sexton if he makes it and probably Daly for North who disappointed again. O'Mahony can captain and him and O'Brien should stay with Warburton benched. So Halfpenny; A Watson, J Davies, B Te’o, E Daly; O Farrell, C Murray; M Vunipola, J George, T Furlong, G Kruis, M Itoje, P O’Mahony, S O’Brien, T Faletau. Last edited by liquidfootball2 on 17 Jun 2017, 13:00, edited 1 time in total. Controversial or what, picking solely on geography may have some merit if it's just all about the first test, but not when it's about trying to win the series. They have the XV for the first test and probably the 23, these callups are highly unlikely to be involved, it's really hard to justify. Launchbury and others far more deserving must be sick at this. Eddie Jones, Sir Ian McGeechan and a host of others have really gone to town with their comments. All will be forgotten (if they win), unlikely imo but this will come back on Gatland if as expected they find it tough. Gatland is getting absolutely ripped apart over this both on the TV and in the press, players coaches and ex stars absolutely livid with him. Calls that he's devalued the Lions shirt and his see through reasoning is just pathetic and doesn't stand up at all. Really are queing up to have a go at him. He knew this with his ridiculous call up of fodder for the midweek game not based on ability but on geographical location. Several Irish and English players are not just arguably but clearly better than the players called up and would have been released after last weekend to acclimatise to NZ if he was going to base selection on location and jet lag. Unbelievably crass, he better win against all the odds or he will be hung when he gets back. He's single handedly put the whole Lions tour at risk of being overshadowed by this highly contentious decision, not only this tour but future tours too. In future anyone who just missed out would be a fool to tour with his national side if it was not to the same time zone and nearby location. No fault of the players he's called up who will naturally do their best and be proud, this is all on Gatland or enemy number one as the British press may now start thinking him. Well, after a bad start they've given a decent account of themselves in the end. Tomorrow's where it starts though. Glad to see Williams, Watson and Daly in the back 3. The three most skilful Lions backs get to play. I'd have Itoje starting ahead of AWJ to try and counter the physicality and athleticism of Retallick but can't argue much with the rest of the team. Lions have to win the front row battle, keep the best Lock combo in the world quiet, hope that Kaino and Reid are rusty, stop Sonny Bill offloading, pressure Ioane and then all they have to do is keep the worlds two most talented backs, Smith and Barrett, from getting any space. North has been extremely poor so far on this tour and looks completely out of touch, so Gatland can't really just ignore this. Daly for me has made a far bigger impression and his stats even excluding the game against a seriously weakened Waikato are so much better as to make it logical. I would have gone Halfpenny, his goalkicking alone is worth it especially if it's a wet day and forwards battle, with Farrell's very iffy recently too. I always thought the Lions only hope of keeping the margin in respectable bounds was the weather. My thinking was if it's torrential and handling is difficult, then a limited game plan built on the forwards, set piece, rush defence and kicking for territory might pay some dividends. 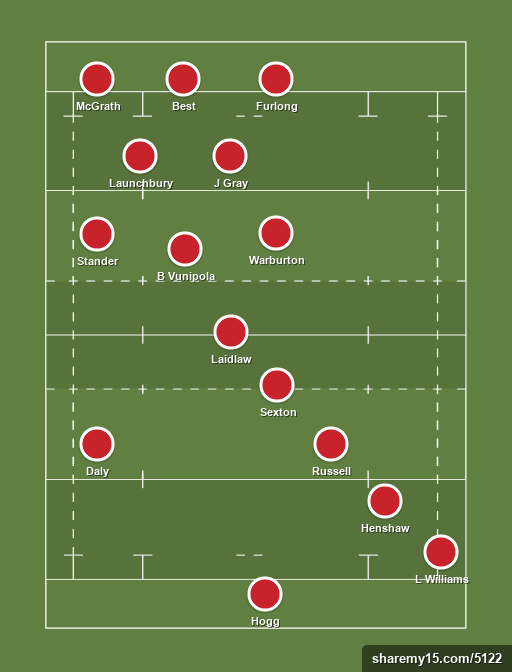 The selection of Williams a more adventurous and exciting runner than the safer Halfpenny points to a more ambitious game than the limited one I thought they'd adopt but one that would possibly be far less suited to difficult playing conditions. If the conditions are wet then a lot of tactical kicking could result, and NZ and Barrett's kicking game is exemplary too. Can Williams as full back anticipate as well as Halfpenny? It will undoubtedly be a major test and a decision they may well regret. They have to stop Barrett getting close to the gain line and stop the offloads to Sonny Bill Williams as any line breaks will result in tries. A massive ask but the worse the weather the more chance of having some success with it. Handing a start to one of the rocks of the previous Lions tour victory against Australia, Alun Wyn Jones is one I found difficult to understand. The selection is likely to have been one of the hardest, given the hugely impressive performances of Maro Itoje, who had started in what was hailed as the closest XV to the Test side in the victory over the Maori. Itoje has been a force of nature on the tour, bringing massive physicality to his game as well as dominating the line-out, but Jones, who started on the bench against the very much weakened Chiefs, is preferred due to his experience and unquenchable warrior spirit and possibly Gatland's personal or perhaps imo badly mistaken loyalty. Tbf it's always pretty subjective as to their best team and Gatland definitely has his favourites. Even so whatever team he picked, and despite my reservations it's not that far off their strongest available (without Billy Vunipola etc), was always likely to find keeping parity with the All Blacks very tough indeed. It's a pretty tall order to match the best in the world on their own patch and to have a real chance of winning they really would have to be so much better than the opposition, something they're clearly not. I would expect a comfortable win for New Zealand on a ground where they're unbeaten for more than 20 years. Very rarely a side wins away from home in international rugby these days unless its far stronger, and this is possibly why Australia are such an embarrassment at the moment, at least that is when compared to their former selves of not so long ago. Well, some decent moments from the Lions, but the All Blacks are just so ruthless. The Lions were right in it for a while, but a couple of key moments - passing up three points in front of the posts when only 5 behind, and failing to kill the ball and make NZ kick it at that scrum penalty from which they broke and scored from the advantage. This isn't exhibition rugby and they paid for those decisions. The consolation try made the score a bit more respectable though, 30-8 would have been harsh, but can't see anything other than a whitewash really. The gap between the All Blacks and the rest of the world is massive right now, they would probably beat a World Lions side including the rest of the Southern Hemisphere. Some promise in bursts from the Lions and one of the great Lions tries, but switched off for two of the tries, which is fatal in NZ, and just not as slick overall as the AB's. Was hoping that Reid might be a bit slow out of the blocks but he put in a MOM performance. Barrett is such a good player. Always makes it look easy and always seems to have time - the mark of a great player. They're all such good ball players. Retallick and Whitelock are big athletic units but have fantastic hands and the AB 2's pick up for his try was worthy of a winger. Watson played very well, as did Williams until he got a head knock when he seemed to fade (and the drop for the second Ioane try was awful). Kruis and AWJ were both poor. Wouldn't be surprised if neither of them start the second test. Faletau and O'Brien were excellent, as was JD and Daly. Lost shape when Farell went to 12 and Sexton at 10. Didn't think Sexton played well at al and Teo was better in the 12 position. That Lions try was fantastic though. Good, intelligent heads up rugby from Williams and JD and great support from O'Brien. Actually thought the AB's looked a bit flat at times and not quite up to their usual standards. Suspect that they'll get better as the tour goes on. The first half seemed to consist of them having the ball and the Lions being unable to get it back, then when we did get it back we'd box kick for 20 yards max gain with 50/50 at best chance of keeping the ball. The box kicking was pretty good quality but I just don't get the odds you work to on them. Williams mazy run started one of the great tries at a time they really needed it, that's what he can bring but it comes at a cost. He was shaky under the high ball on more than one occasion, most notably his abysmal effort for their third try. His positional play at full back isn't all it could be and his inclusion meant we had no reliable kicker too. I think his best position is undoubtedly out wide but it wasn't where the match was lost. NZ won it at the breakdown, it's that ability to recycle so quickly while the likes of Crane and Retallick disrupt and slow up the opposition's ball that is so vital, those seconds dictate the whole speed and intensity of each team's attack. I thought BB back to 15 and Cruden on for Smith may give them half a chance but we needed to win the third quarter to really compete and just after half time had chances. Turning down three points wasn't the right decision, and taking off O'Mahoney so early for Warburton wasn't either although fair enough if injured. We lost any advantage of securing at least the line out for no perceptible gain at a time when the scoreboard was close. Sexton also helped weaken the side by moving Farrell when the combinations in the mid were working well. Te'o was exceptional but all changed with some really hard to fathom subs. Yes its a 23 man game and replacements are as important as the starting 15, but they seemed to Introduce the wrong personnel at just the wrong times when the match was at a crucial phase. There is no getting away from the fact that NZ are the best in the world and can only really have a close game away from home, I still think a full strength England team at Twickenham represents a far tougher task. Last edited by liquidfootball2 on 25 Jun 2017, 10:43, edited 2 times in total. Should Maro Itoje start in the second Test? Saracens' former European player of the year had to be content with a bench role after Lions head coach Warren Gatland said it had been a proverbial "toss of the coin" in selection between England lock Itoje and Wales captain Alun Wyn Jones. Jones got the nod, but he struggled during the first half and eventually made way for Itoje early in the second period. Hindsight is a wonderful thing, yet Itoje would probably have made much more impact from the start. Some of us, maybe actually most of us didn't need hindsight for this one though. With Gatland there was always likely to be an element of Welsh bias... and generally Welsh players who were at their peak 4 or 5 years ago. The All Blacks will improve and the Lions will probably need to, more than they can possibly achieve, to match them. Nevertheless they need to compete as best they can and its probably fair to say they do have a lot more in them. Naturally the lack of support players making the runs which enable line breaks to be converted and every chance taken, has been a common theme so far on the tour, but this is often hard to easily put right on a short tour and usually comes with familiarity and playing as a team for a time. I think the real area of concern though and where the test was really won and lost was at the breakdown. Crane and Retallick were always there to slow and disrupt and were really top draw, consequently our loose forwards and second row just didn't clear out and recycle with anything like the speed and efficiency required. Where I would advocate selection switches is in the second row. I would have a look at starting with Courtney Lawes and Maro Itoje, and I think that’s an area they will look at. They could help with the pace of the game. I think CJ Stander and Wales' Justin Tipuric who I suspect is also likely to be Gatland's man, will also have a chance. Overall, though, the Lions have the in-form players in the side – and you must give them the opportunity to keep playing. I'm pretty certain it's all fairly futile and I for one can only see a comfortable whitewash with the Lions struggling to keep the score getting completely out of hand. This may be the case of course but even so they can't themselves have that attitude, and they must somehow believe and have confidence that what looks very much like the unbridgeable can actually somehow be bridged. forestfan wrote: With Gatland there was always likely to be an element of Welsh bias... and generally Welsh players who were at their peak 4 or 5 years ago. Eddie Jones had stated he is only interested in England until his contract finishes after the next World Cup. He hasn't though ruled out being in charge at a later date but just did not want that interference with his main objective at this particular important time for England's development. He is still aiming for England to be the number one ranked team by the 2019 World Cup.